Normally, what happens in Vegas stays on the strip. But this isn’t one of those times; we’re eager to share details from our recent trip to Atmosphere 2015, a weeklong conference put on by Aruba Networks that talked about the future of the enterprise office. What does the future of the enterprise office look like? Historically, Aruba’s focus has been wireless networking. But we’re big fans of how they’re starting to use BLE beacons with their indoor wayfinding platform Meridian (Aruba acquired Meridian in 2013). They use “indoor GPS” to provide people with real-time information about the locations they’re in. 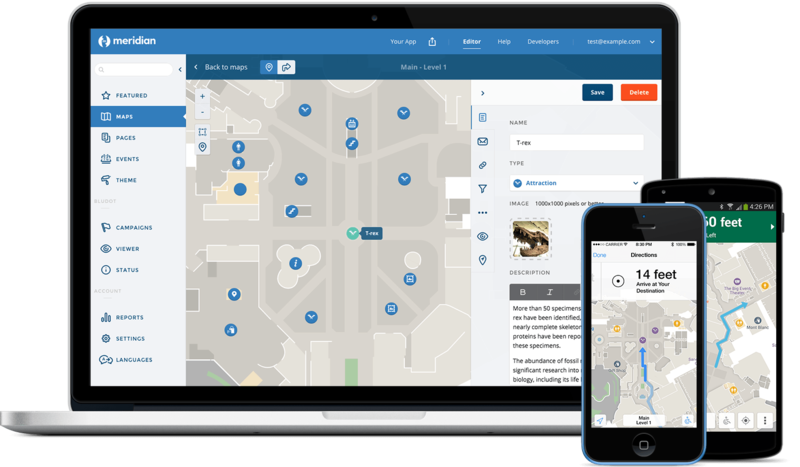 One application is the Levi’s Stadium in Santa Clara, where beacons power turn-by-turn navigation and deliver contextually relevant information to people’s mobile phones. 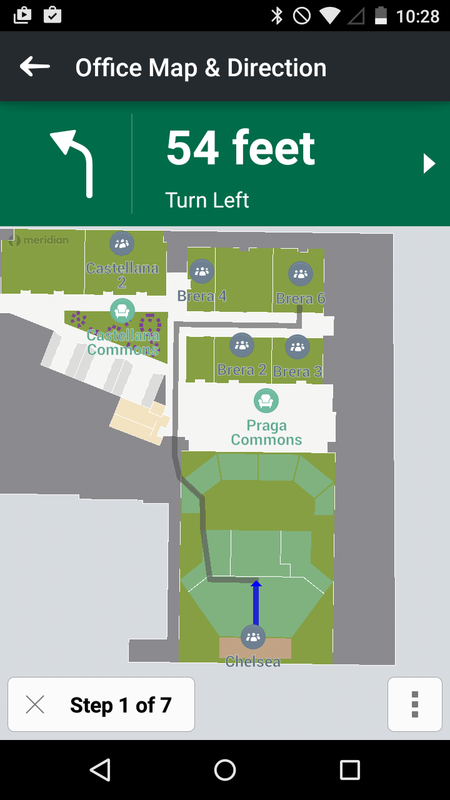 Instead of missing the action during a 49ers game to stand in line for concessions, the app shows directions to the beer stand with the shortest line or lets fans order snacks right to their seats. During his product keynote, CTO Keerti Melkote demonstrated benefits of adding beacons in retail, hospitality, and enterprise spaces, especially as customers move towards mobile-first connectivity. 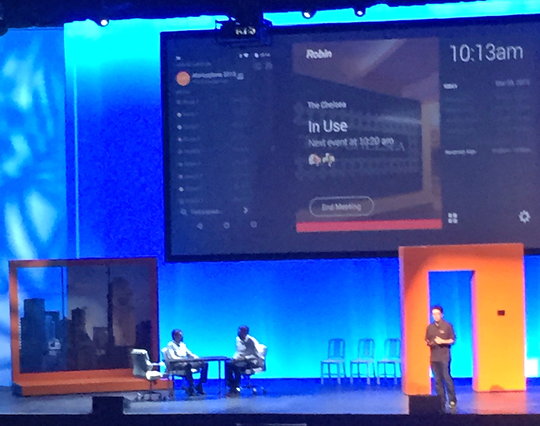 Keerti Melkote (CTO, Aruba), Ben Gibson (CMO, Aruba) and Kiyo Kubo (CEO, Meridian) doing a live demo of Robin. 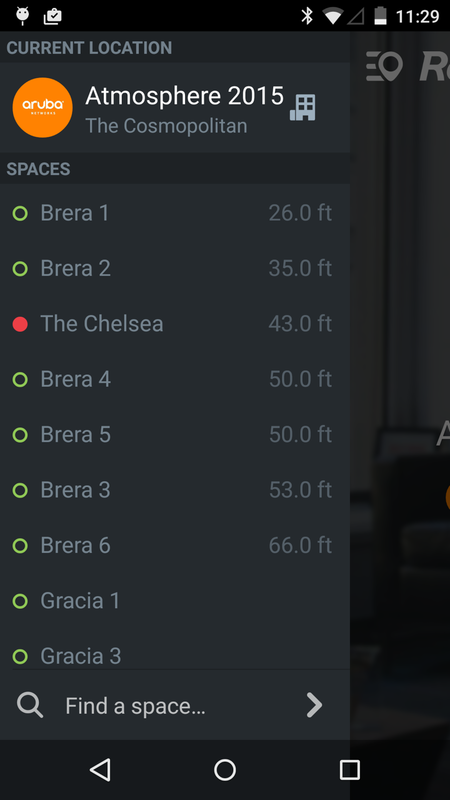 Using Meridian, this version of Robin added distance to each available room. Booking a meeting room through this version of Robin included the option to navigate there. Aruba’s vision of the future is not far off. In a hospital, a patient’s chart will automatically open when her doctor approaches. In a classroom, a teacher can take attendance from his mobile phone and see when and where truant students were last seen. In offices, meeting rooms book themselves when someone walks into them, and people can easily find and book meeting rooms from their mobile phones. Sound familiar? We think so too. The team had a great time showcasing future office tech, and we owe the awesome teams at Aruba (Meridian) a big thanks for asking us to share Robin with their customers. Offices of the future will make you look like a superhero. The best part? The technology to get started is here today thanks to beacons and other connected devices. Here’s five ideas for how beacon tech will make the workplace better.